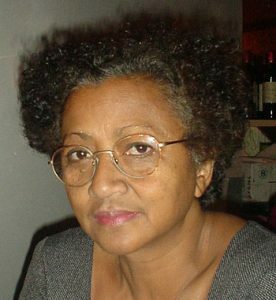 Michèle Rakotoson is one of the most successful and critically-acclaimed authors in Madagascar. Born in Antananarivo in 1948, she lived in Paris for political reasons from 1983 until 2008, working as a radio and television journalist whilst writing numerous novels, short stories and plays. She writes in French and Malagasy, and her work is pertinent to both traditional Malagasy culture and global contemporary themes. For example her play Sambany about an infertile woman and her rebellion, written as both a French and Malagasy version, has been described as a classic of Malagasy theatre and women’s theatre. In her 2007 autobiographical work Juillet au pays, Rakotoson meditates on her first return home after years of exile. Since returning permanently to Madagascar she has dedicated much of her time to promoting Malagasy publishing through the initiative Project Bokiko, in addition to creating opportunities for emerging writers, such as workshops and a national short story competition. In 2012, the Académie française awarded her the Grande Médaille de la francophonie for her body of work.